PC hardware and games are coming on like gangbusters in the past twelve months with multiple desktop platform updates and the introduction of blockbuster games like Playerunknown’s Battlegrounds. 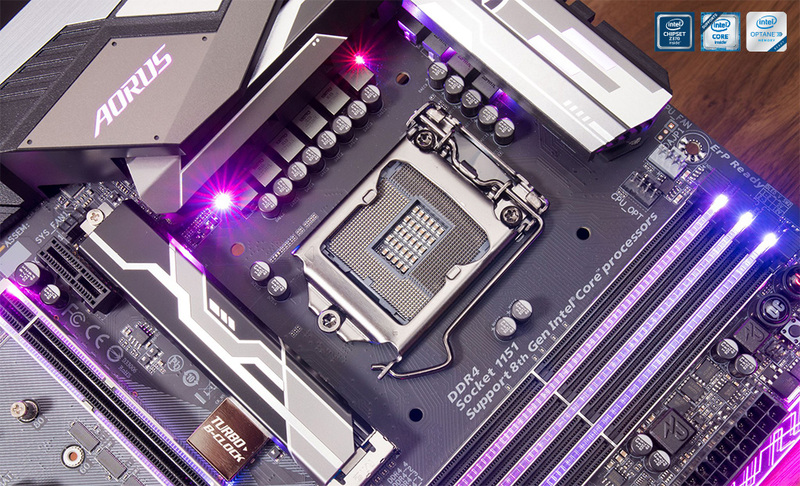 In this article, we are diving into the Z370 AORUS Gaming 7 motherboard equipped with Intel 8th Gen Core processors for the fastest gaming performance available. This is an exciting time for PC enthusiasts looking to get a big upgrade or for anyone looking to join in on the hottest games out there. Z370 AORUS Gaming 7 is compatible with Intel 8th Gen CPUs. Buy it now at Newegg & Amazon. 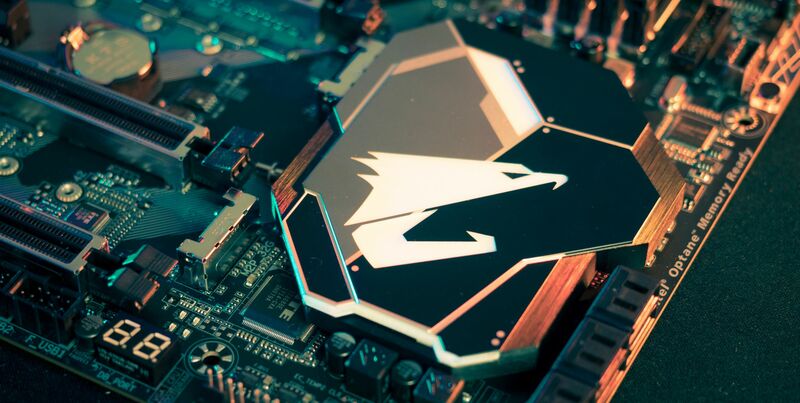 The AORUS Z370 Gaming 7 is a unique board in its class with the introduction of more cores on Intel’s desktop platform. Codename Coffee Lake, the 8th Gen Core processors add 2 additional cores across the lineup with up to 6 cores on the flagship i7-8700k, all without sacrificing clock speed for great performance. But be careful, the new Z370 boards are not backward compatible and only work with 8th Gen Intel Processors while still sporting an LGA 1151 socket. If you are looking to get the most out of your CPU, AORUS provides an easy overclocking guide that provides a step-by-step process through the UEFI to supercharge your setup. With an obtainable 5GHz+ overclock and 6 cores for improved multitasking, the new Z370 platform benefits all users from the PC gamer looking to stream to the content creator looking to optimize their workflow. To keep up with the performance hike, AORUS ensures that all components are properly cooled during extended workloads with Smart Fan 5. Managing thermal activity is critical in a PC system and the Z370 AORUS Gaming 7 provides optimal support with 9 temperature sensors and 8 hybrid fan headers with interoperable control under the Smart Fan 5 utility. Each fan is able to react in real-time to changes in temperature to pinpoint where airflow is most needed under load. If you’re a fan of watercooling and require a multitude of customization or just a closed loop solution, the hybrid fan headers can detect the type of device and supply the correct PWM or Voltage signals. As closed loop AIO coolers rise in popularity for that easy bump in thermal performance, it also poses an issue with limited airflow over VRM heatsinks, especially for overclocked systems. The Gaming 7 mitigates all of this with an included onboard fan to facilitate airflow and prevent any thermal throttling keeping critical components in operable temperatures. Here at AORUS, we strive to offer features that enhance the users experience throughout. When picking up the Z370 AORUS Gaming 7, it’s easy to see the wealth of details that make this motherboard worth it. Multiple storage options are available to fit up to 3 M.2 PCIe SSDs with RAID capabilities and an additional 6 SATA ports for maximum capacity. The Gaming 7 also ships with an included M.2 thermal guard to regulate heat around the M.2 slot. This board is also compatible with Intel Optane technology giving a substantial boost to systems in need for faster storage speeds. Content creators buoyed by more cores on this platform will be glad to know that the Z370 AORUS Gaming 7 can operate up to 64 GB of DDR4 ram with OC speeds up to 4133MHz. This increase is valuable for all users as modern software consumes more power than ever. Running multiple applications such as web browsers, pc games, media players, streaming programs, and more will all benefit from the multitasking performance provided by the platform. Great looking aesthetics is an important growing trend in PC building and it really shows with uniquely designed hardware shining through pristine tempered glass cases. Random rainbow-colored plastic mainboards have faded into the past and random rainbow LEDs are now in, I’m told these fads are cyclical. But with LEDs we can tailor their hue to match everyone’s individual preference or even turn them all off, it’s your choice. To make it easier, AORUS can now control more lighting effects than ever with RGB Fusion software. If you are looking to match your keyboard, mouse, case, or even RAM, then it can all be done through our software utility. Express your style with creative lighting zones using both RGBW and digital LED light strips. Visuals are just part of the package and AORUS audio stacks just as high with an onboard ESS Sabre DAC to deliver high-quality acoustics for all applications. Found in standalone high-fidelity systems, the Z370 AORUS Gaming 7 utilizes the Sabre DAC to output a dynamic range of 121dB backed with professional grade WIMA and Nichicon gold capacitors. Get precision audio without noise for the ultimate audiophile enjoyment. Details matter and the whole is only as good as the sum of its parts. The Z370 AORUS Gaming 7 builds upon years of R&D to never forget our Ultra Durable roots with reinforced slots for components all around. Our AORUS Xtreme graphics cards pack a hefty weight and the extra anchor points on the stainless steel PCIe slots go a long way to reduce sagging graphics cards. All AORUS motherboards also implement anti-sulfur resistors to prevent corrosion over time for longer lasting lifespans. All Z370 motherboards are also now compliant with new California Energy Commission (CEC) 2019 standards for lower power consumption.